“We are holding our own, despite the pressures of the last few years,” according to Steve Goss, assistant superintendent in the Vicksburg School system, as he explained the audit results from BDO for the years 2012/13. He remarked that it was smooth sailing with no audit adjustments, resulting in a clean or unqualified opinion. The audit helps to understand the long-term prospects of the school district, both its assets and liabilities, Goss told the Board. The meeting was held at Tobey elementary school, featuring a report from Principal Mike Barwegen. The motto the school recently adopted was “Retake the Hill” in response to the drop off in one year of the achievement gap from 2011 to 2012 on the state’s MEAP test. Barwegen went on to explain the school-parent compact for how parents, staff and students will share the responsibility for improved academic achievement in effect for the current school year. High quality curriculum and instruction. Parents reasonable access to staff. Parents the opportunity to volunteer. Work as a partner with my child’s teacher to ensure my child’s education. Support and model the “Tobey Way”. Create an environment that enhances my child’s education. Take responsibility for learning by completing assignments, finishing homework and working hard. Pursue my learning with enthusiasm. Vicksburg’s Varsity Boy’s Tennis started out their season with three conference wins. Returning Coach Warner Offord and Assistant and JV Coach Bruce Dillon lead the varsity team to a 7-0 win over Dowagiac, 5-3 over Paw Paw, and 8-0 over Plainwell. After those three conference victories, #1 singles player senior Mitchell Wilson, #2 senior Quintin Haring, and #3 junior Kaleb Lewis were undefeated, as was the #4 doubles team of sophomore Daniel Gwin and junior Logan Tassell. The Bulldogs participated in the Greater Kalamazoo tournament, placing seventh out of 12 participating teams: #3 singles Lewis took a 2nd place finish, as did the #4 doubles team of Gwin and Tassell; #4 singles junior Chase Tyre landed a third place finish as well. Vicksburg suffered a 2-6 loss on their home court to Allegan, with individual wins being landed by #1 singles Wilson and #3 singles Lewis. They followed with an 8-0 victory over Dowagiac in a conference cross-over match, then travelled to Marshall to score another big 7-1 win . Individual victories at Marshall included singles players #1 Wilson, #2 Haring, #3 Lewis, and #4 Tyre. Doubles team victories included #1 seniors Zac Decker and Alexander Ensing, #2 junior Artem Booth and senior Jenner Wile, and #4 Gwin and Tassell. Rounding out the Bulldog roster for the 2013 season is #3 doubles team of junior Richy Livingston and Westin Seifert. Vicksburg ended its regular season third in the Eastern Division of the Wolverine Conference, and took fourth at the conference tournament. The Bulldogs completed their 2013 season with an eighth place finish at the Boys’ Regional Tennis Tournament. The Central Michigan University Leadership Institute is pleased to announce that Brianna VanCamp of Vicksburg has been selected to join the 2013 Leader Advancement Scholarship cohort. The Leader Advancement Scholarship is awarded each year to 40 outstanding incoming freshmen who have distinguished themselves through a record of leadership and service. VanCamp served as the senior class vice president of Vicksburg High School Class of 2013. In addition, she was an executive for the student senate, participated in HOSA National Leadership Conferences, and did a number of volunteer projects, including Habitat for Humanity, Bronson Hospital VolunTEEN, and Special Olympics. This record of leadership and volunteerism helped Brianna stand out in a pool of nearly 2,500 applicants to be selected for a Leader Advancement Scholarship. Opened in 1998, the Central Michigan University Leadership Institute is the premier collegiate leadership program in the Midwest. The Institute gives students an opportunity to develop their leadership qualities. The organization is committed to providing students and members of the community with opportunities to continually enhance their leadership skills. The flagship program of the Leadership Institute is the nationally-recognized Leader Advancement Scholarship. Members of the Leader Advancement Scholarship cohort reside in the leadership hall, Barnes Hall, and complete a four-year academic and co-curricular protocol. Scholarship recipients are afforded the opportunity to enroll in general education coursework with a leadership component infused into the classroom experience. Outside of the classroom students contribute volunteer service, attend leadership development trainings, and mentor incoming students. Brianna is currently enrolled at CMU and plans to enter the Physician’s Assistant program upon completion of her Bachelor degree. She is the daughter of Wendy (Steve) Pheils of Vicksburg and Kevin VanCamp of Mendon. Mike Cloney, a coach of middle school youngsters for 36 years received the ultimate honor of induction into the Michigan High School Coaches Hall of Fame in September, 2013. He was a Vicksburg High School graduate in 1962 and while in school, had a part-time job at the Commercial-Express. His coaching years were spent in Mattawan where he also taught world geography for 40 years after graduation from Western Michigan University. Cloney was honored as one of the first coaches in the state who spent his entire career with seventh and eighth grade kids, including a stint at St. Monica’s in Kalamazoo where he had the good fortune of coaching both of his children. While in Mattawan, Cloney coached football for 35 years, basketball for 28 years and added baseball for five. This amounted to 68 seasons altogether, and over 700 games. He had previously earned varsity letters in Vicksburg in all three of these sports. Along with the honor of being recognized by this prestigious fraternity of athletics, he and Ed Cloney, are among the very few father and son combinations to be selected. “It meant a lot to me, knowing that my dad was inducted back in 1970. I was proud to carry on the tradition. The elder Cloney spent his coaching years at Owasso and 14 years at Portage Central while the family resided in the Vicksburg school district. “The joy of teaching is when students come back and want to look you up and share their life stories,” Cloney said. “I’m often told that they are grateful that I listened to them and took an interest while they were young teens. You have to love middle school kids or you shouldn’t be there teaching. We always had a lot of fun, but while still being fairly tough on them,” he concluded. Mary Burke was honored by the Vicksburg School Board for being selected to receive the 2013 Distinguished Alumni Award from Western Michigan University. She is pictured here with Laura Kuhlman, the Vicksburg Middle School principal. Science teaching is Mary Burke’s specialty in the Vicksburg Middle School. She was recently honored for her work by the faculty of Western Michigan University’s (WMU) Mallinson Institute for Science Education, as its 2013 Distinguished Alumni Award recipient. The courses and workshops for teachers of science in the Mallinson Institute are designed to help prepare them to think critically about why people should become scientifically literate, what science is most important to know, and how their students learn. Burke has put this practice to good use in her teaching. Burke has served WMU after receiving her undergrad degree from Central Michigan University and her master’s degree in science from WMU, as ‘teacher in residence’ to promote middle school science teacher education. In her 17 years at Vicksburg Middle School, she has taught over 2,000 science students, who have left to become nurses, doctors, engineers and teachers, of which she is justifiably proud. Burke is passionate about teaching science and as an instructor of a WMU science methods course, believes it has made her a better teacher; but more importantly, she hopes to be creating great science teachers for the future that will in turn instill the love of science in their students. I love the challenges and possibilities that are in front of me every day, as I face 140 seventh graders by trying to help students own their mistakes and learn from them. I constantly think of what I need to do instructionally to help them grasp the concepts, how do I help them learn how to help themselves. My classroom is a living lab for analyzing my students, analyzing my instruction and my approach to the content. Quick decisions are required to address these needs and when I am done, I reflect once again on what I could have done differently and what I could do to improve my students’ understanding. “My administrators have been more than bosses, they have been my cheerleaders. They have pushed me to achieve and to lead others to achieve. They have believed in me to let me try new things, make changes where I believed they needed to be made for the betterment of our district, building, my classroom or course content,” she said. At the same time the amazing people at VCS and WMU she has worked with over the years have also contributed to her personal growth as a teacher, she said. Science was in Burke’s early training as she literally grew up in a veterinary clinic with her parents Drs. Don Lohman and Carol Neal Lohman, as her instructors in the Portage Animal Hospital and at home around the dinner table. Her mother was near tears as she sat listening to the accolades heaped on Burke during the Vicksburg School Board meeting in October, having served in this capacity for the last 29 years and watching over the evolution of the science programs throughout the district. Students put pieces together to build the framework for the robot they hope to enter into the design contest for robotics. The robots will be on display during Science night early next year at the Vicksburg Middle School. “Robotics is the Super Bowl for the kids who don’t play sports,” says Kevin Richards, volunteer coach for the Vicksburg Middle School students who have signed up for the club. They scrimmage just like sports teams do and they have playoffs with the ultimate achievement to go to the state meet. They are scored by how the robot moves on its own in a 30-second demo and how it moves using an X-box type of controller to drive the robot and maneuver it. The requirements of the games are developed by the parent organization called First Robotics, that was founded by Dean Kamen, the inventor of the Segway in the 1980s. The meets go all day long as the teams build up points and at the end, pick an alliance partner for matches that are single elimination. Last year, the Vicksburg team was fourth in competition for schools from the west side of Michigan. This year there are 26 students from six, seventh and eigth grades with three girls participating. The Vicksburg Middle School program has been in existence since 2011, when Steve Fryling a science teacher helped get a grant and acted as the liaison with school officials. The first year the team took second place at the state meet, and these students have now moved on to the high school where a new robotics club is being coached by Amanda Szczesny, an English teacher. Richards says that about half of the middle school students he works with have never even seen a screw driver before, but they do catch up as they show a passion for the two nights a week the club meets and constructs their robots. “Parents are required to help the kids, but what we really need are engineers from area firms to teach the mechanics of robotics and take the teaching to the next level,” Richards explains. Coaches Scott Adler and Kevin Richards hold a robotics model that middle schoolstudents have been constructing. Not pictured is Pam Elliott, a grandmother of one of the children in the program, who works at Stryker on CAD projects. She comes in every week to help coach the computer part of building the robots. “When the ideas get flowing and the students get it, the results are stunning,” Richards comments with justified pride. 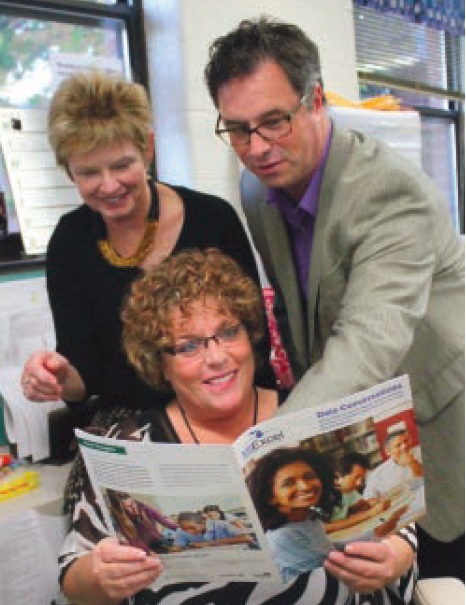 Jamie Masco, an instructional consultant at SunsetSchool who helped forge the plan for improvement along with Principal Pat Moreno and Grant Chandler of the MSU College of Education, look over the brochure that describes the focus school effort at Sunset Lake School. So, what’s a focus school anyway, a concerned grandmother asked the Vicksburg Board of Education at its September meeting? She was referring to this declaration for Sunset Lake Elementary school in 2012 and most recently 2013. Dr. Grant Chandler, who has been the on-site representative from the Department of Education’s MIExcel program, led the board’s discussion in October of what this means to schools in the state and how Vicksburg is responding to the designation. Over 2,800 schools in Michigan were ranked (another 700 did not get included) from top to bottom for student performance on the MEAP tests taken in the fall of 2011 and 2012. Evaluators looked at the gap between performance at the top and bottom of each school, scored them on a bell curve with the 10 percent of schools having the largest gap in achievement on the tests, labeled a focus school. Approximately 300 schools fell into this category he reported, Sunset Lake being one of them. Even though this school had some very high achievers, it also had some very low scoring students, thus the gap. The challenge, he said, was how to bring up the bottom tier to close the gap in all phases of academics when Sunset has the highest population of socioeconomically disadvantaged students and students with disabilities in the District. Why focus on the gap? The Federal requirement makes very clear if children are not being successful, then it is challenging school systems to do something about it. Because Sunset is a Title I building, it is eligible for Chandler’s help and that of the contracting agency which is the Michigan State University, College of Education, Office of k-12 Outreach. He has been working with staff in the whole district to come up with an action plan that is being implemented system wide with special attention to Sunset’s needs, he said. Chandler complemented the district for its dedication to improvement by latching on to the training from its field specialist. At Sunset, the staff has planned a whole series of interventions, with a long list of things they are doing when they first looked at the data passed on from the state. They explored the data in three phases and once the analysis took place, began to put together their action plan of “Big Ideas” which has been implemented for the 2013/14 school year. “They have made something good, come out of a perceived negative,” Chandler stated in his report to the school board. “This school has now become the model for a brochure that we use to help many of the other school systems as they face this process of improvement. It is causing schools to look with greater intensity than they have ever looked before. Vicksburg’s motto is ‘Success for every student, whatever it takes’, and they are doing it,” he concluded.